A special memorial event took place at the Ching Ming Festival commemorating the late Dr. Cheung-kok Choi, at the Choi Building, University of British Columbia. It would have been Dr. Choi’s 90th birthday. He passed away three years ago. 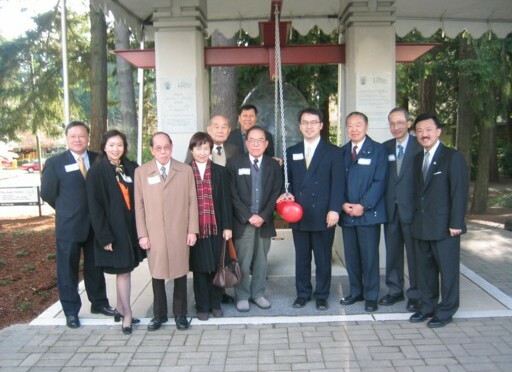 At the same time, a Ming Dynasty imitate “Peace Bell”, co-sponsored by Dr. Cheung-kok Choi Memorial Fund and UBC, was unveiled. There was an attendance of some 200 from distinguished members of society and officials from the Governments. The Institute of Asian Research is housed in the Choi Building. Researches include China, Japan, Korea, India, Southeast Asia, and Australia. (Left to right) Dr. Pitman Potter (UBC Institute of Asian Research Director), Dr. Martha Piper (UBC President), David W. Choi (Chair, C.K. Choi Foundation, UBC Institute of Asian Research International Advisor), Dr. Frieda Granot (UBC Dean of Graduate Studies).